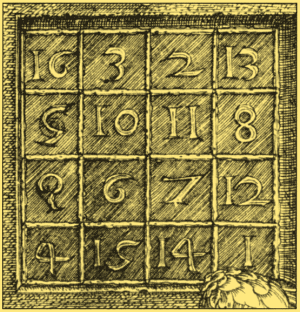 The image on the left is the magic square depicted in Albrecht Dürer’s famous etching entitled Melencolia I. Using all the whole numbers from 1 to 16, the sum of the numbers in every row, column and diagonal is a constant 34. There are 880 such normal magic 4x4 squares, compared to just the one distinct solution for the 3x3 magic square; it is customary to treat reflections and rotations of an arrangement as just one unique solution. This Dürer magic square is particularly ingenious as the sum of the four corners and the sum of the four central numbers also equal 34. However, today we’re going to look at something slightly different. Instead of adding the numbers together, we are going to multiply them. Construct, using only distinct positive integers, a 4x4 magic square such that the product of each row, column and diagonal all equal the same number M. Find a square that yields the smallest possible value of M. Include your method of construction. Hint: the positive integers in the solution cannot be consecutive - try it! - but they do have a deeper kind of order. 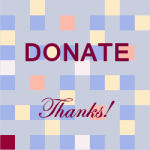 Send your complete solution by email to pmq26loshu@giftedmaths.com. This email address shall be removed after the competition closes to avoid spam. This PMQ26 competition closes on MONDAY 8 July at 23:59 GMT - one extra weekday from now on.